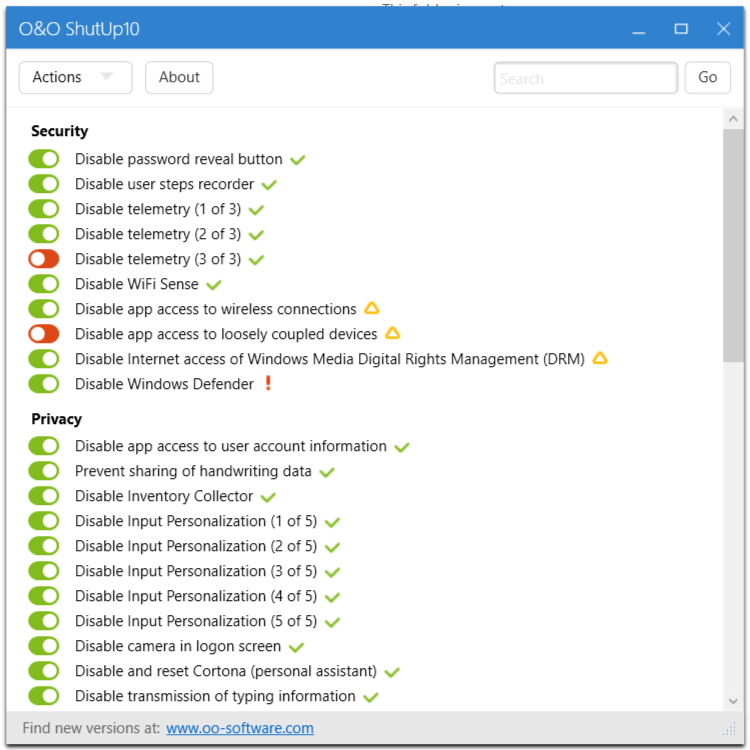 O&O ShutUp10 gives you full control over which comfort functions under Windows 10 you wish to use, and you decide when the passing on of your data goes too far. Using a very simple interface, you decide how Windows 10 should respect your privacy by deciding which unwanted functions should be deactivated. Excellent program for reducing what you send to Microsoft. Used fairly aggressive settings and nothing broke. I would suggest you run it again after every major Win 10 update, as MS tends to change settings by default. This is ok. But I prefer W10Privacy (http://www.winprivacy.de) plus Aegis (https://voat.co/v/technology/comments/853510) These two are regularly updated and will get rid of all the prying MS eyes. Best of the best! only use this if you want control over windows! Great add-on to Win 10, I've had no issues whatsoever using it - Checkout Ashampoo Anti-Spy which is similar & also free but covers a few bits this don't. Most excellent software, just what the doctor ordered, so shut up Microsoft and stop snooping on your customers who buy your software, it is very unprofessional even thought you tell us you do not do it, we do not believe you at all! Already the 4th update since I started using it. They seem to be working hard to keep it on par with all the Windows 10 changes MS keeps injecting. Keep it up O&O! Great program saves tons of time manually doing this. Only problem is that of course turning these things off puts warnings and other stuff in the Event Viewer. Email them like I did say great program but can you cure the errors in Event Viewer that this causes. It will be a better program for it and they are receptive to feedback. You can get anything better, also from a great company!! The start of something great. 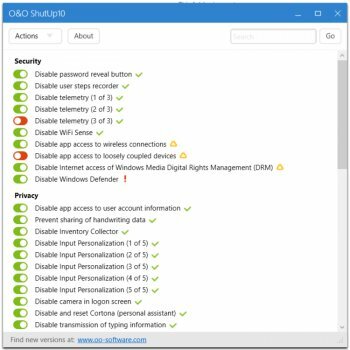 Everything you need to get a handle on negating the invasive data collection MS has chosen to build into Windows 10. We need tools like this. We need easy to use, free, thorough utilities to help users take back their privacy. Kudos to O&O for taking this first step. I look forward to their next update.